… Will not necessarily be exceeded by the value of the whole. This is my conclusion with regards to making items from various ingredients anyway. My initial aim was to balance the cost of making items to their sale value, so that a sensible economy was maintained in the world. However, there are some circumstances where such balance is simply not going to happen. In other words, some items will cost more to make than they would eventually be worth on the open market. However, after a great deal of item cost rearrangement, the number of items that are worth less than they cost to make are far fewer than before, and those that still are can be justifiably explained (in my opinion). As a general rule, the more powerful the magic, the less you get in return for your input. (Think of the cost of increasing the amount of cache memory in a computer for the return performance it gives.) As an example, a crafter might get a reasonable return for a crafted item up to +5 in power, but thereafter (+6 and above), the cost becomes more than they would get in return for the items used in its creation. This, of course, gives added reason why items above +5 in a world are seen far less than the smaller values. Crafting items of a higher power becomes more of a personal achievement than about money making. And this would also explain why such items would not normally be sold on the open market, unless of course, the seller did not craft the item in the first place and was simply making what they could from the item. To reflect an area of cost I am talking about, look at the table below that shows the value of using essences to create an item compared to the market value that said crafted item would reach. NB: When I speak of crafting, I also mean it to include the ability to enchant items, as they are closely related. Both speak of creating items using other items as ingredients or catalysts in some way. Please note that the values above are a guideline only and may not be the exact values acquired in game due to other varying cost factors and bartering. From the above table you can also see that the value of essences has been greatly reduced from the norm. The next table shows all the values of essences available. In the OC, essences costs ran from 150 gp – 100000 gp with no distinction between the types, but now I give a greater value to spirit and power essences, which I believe are used in the more powerful enchantments. Note also that the lesser essences convert 2 to 1 (unchanged), whereas the greater essences now convert at 5 to 1 (from a previous 8 to 1 conversion rate). Another consequence of these adjustments is that ammunition and thrown weapons will now only be available in quantities of 20 and likewise the same ammo will only be crafted in quantities of 20 at a time. I am using a guideline of around 100 - 250 gp cost for the amount a PC will have to pay for magic ammunition or thrown weapons. I decided to include darts, shuriken and throwing axes in the same relative costs as arrows, bolts and bullets and current testing shows a base cost factor of 0.001 and a multiplier of 0.01 in the baseitems.2da for all of them gives reasonable cost results. The “modern-day” recipes that describe how to craft or enchant items will also be available in Althéa. Their cost is always around 4gp (EDIT: Some enchantments cost slightly more.) as they will be single use items in my world and creation recipes will still require ingredients to use (enchantment recipes will only need gold). (Molds cost more in the first place but can be used repeatedly.) The advantage of using recipes is that they often (not always) aid the crafter to create or enchant an item at a lower level than would otherwise be required. The disadvantage of using recipes, is that there is usually a much higher cost gold involved (reflecting the ease of use) to complete the item. Overall, the cost of items feels more realistic to me and the economy comes across as more achievable to the population where stores and general crafting NPCs are concerned. No longer will an NPC have a multi-million gp-worth store containing many amazing items (no matter what the level of the module is aimed at), but now, the storeowner will have most items running into hundreds at most, with a few exceptional items at higher levels. In most cases it will benefit the PC to craft any items that they want to use, as it will be cheaper than if they simply paid for them. Some items will not even be available to buy and crafting (or finding) will be the only means of their acquisition. Sometimes, selling crafted items will bring a little gold profit and at other times the cost of the ingredients will outweigh the final worth of the crafted item; the player must make a decision if they want to make such an item or not. However, as the PC grows in wealth, gold will become less important than the items they can craft and so the decision will become less difficult to make. 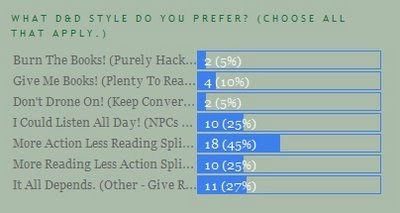 The poll about which style of D&D you prefer to play (more action v more reading) ended a couple of weeks ago with a healthy 40 votes. The results are quite interesting and may be skewed slightly by the way I asked for votes (in that you could choose more than one response). However, if I am to take it that everybody did vote on every aspect they wanted, then it certainly looks like an almost 50-50% split! For me, I believe that means I need to concentrate on a method of play that allows rewards for both styles of play. In all fairness, I believe the “action” player is already rewarded by their keenness to take on more combat: more combat means more experience. However, in the past, players have not quite had the same direct kind of rewards for doing more reading (unless you consider the read a reward in itself). Therefore, I have concluded that I will continue to invest some time in my “reward tests” for players who take the time to read any books they find. Experience will not be rewarded just for picking up a book and reading it (although that could still possible in some circumstances), but PCs will be rewarded according to how much a player remembers (or finds out) through further reading. How this will play in practise, only time will tell. Whatever the case, I hope it will offer an interesting playing opportunity to those that like to read and become involved in a world mythos. And a happy 4th July to all our American friends! Well, as I am a fan of reading(and writing), it's possible you could go in a "Witch's Wake" direction and make roleplaying a route for experience points. It seems your book system might have this, but I say so anyways. What's interesting to me, from a design perspective, is that sometimes the most interesting things to make don't interest the player at all. I guess I mean combat seems the primary focus of most games(not just in NWN2), and that's somewhat odd. And I know what you mean about the things that interest players. I have tried taking the approach this time around of how I would like to play the game - and hope it will appeal to others as well - but tried not to alter too much of the standard that people still expect.